Sandro Botticelli became one of the symbols of the Renaissance with his series of paintings representing mythological subjects. 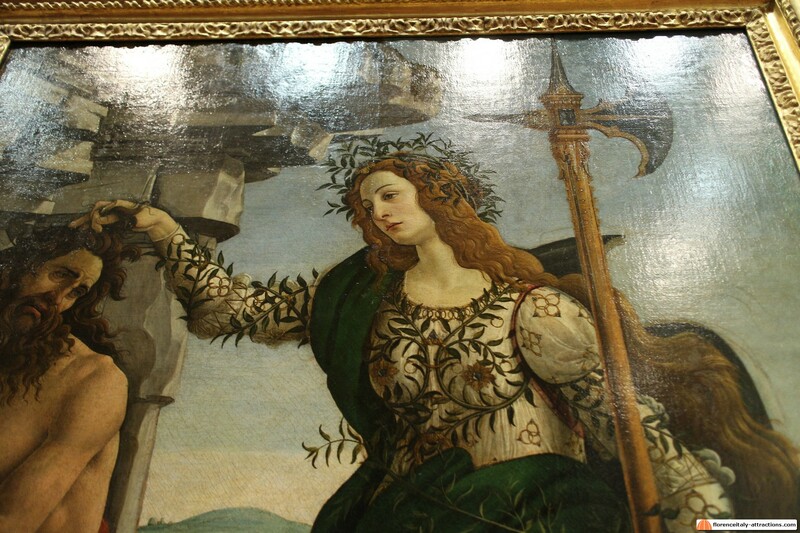 His works are the highlight of the Uffizi Gallery. Although his Birth of Venus and Primavera are the most famous, Pallas and the Centaur is very important because we know what it means. The interpretation of this painting helps us understand how subtle and complicated was the language of arts in Renaissance Florence. The painting was executed by Sandro Botticelli in 1482-83 for the Medici family and today it is on display at the Uffizi Gallery. It represents Pallas as a young beautiful woman, holding the hair of a centaur. Considering Pallas as a symbol of knowledge and wisdom, and the Centaur as a symbol of animal instinct, it’s easy enough to interpret the painting in general as a symbol of intelligence holding the primitive nature of the man. This intellectual superiority is related to the neo-platonic philosophy which became very important thanks to the sponsorship of the Medici family. 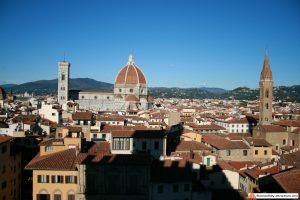 It was Cosimo the Elder to start the Neo-Platonic academy in Florence, grouping together the best thinkers and philosophers in Tuscany, Italy and even from Constantinople, and Lorenzo de Medici, his grandson, continued this tradition. 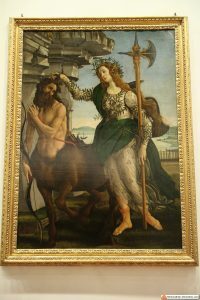 There is a political event happening in those years, involving Lorenzo, which helps us explain Botticelli Pallas and the Centaur. In 1478, Lorenzo de Medici and his brother Giuliano faced the Pazzi conspiracy, a plot to remove the Medici family from their position of rulers of Florence. The conspiracy failed, because only Giuliano was killed while Lorenzo survived and obtained once again the support of the official government to condemn to death his enemies. The problem was that the Pazzi, a rival family of bankers, were not the only ones to organize the conspiracy: they had a powerful allied in Pope Sixtus IV, and the Pope himself could count on the help of the King of Naples. After the conspiracy failed, both the Pope and the King decided to take Florence with the force. A powerful army started to move against the Tuscan city, that didn’t have sufficient military power to resist. Lorenzo de Medici left Florence for a risky trip to Naples, trying to deal with the King, in order to convince him not to attack his city. 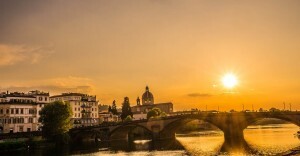 The King, while deciding on the deal proposed by Lorenzo, arrested the Medici and only after some months he accepted the proposal of a new alliance that saved Florence from war. Back to Florence, Lorenzo was considered a hero and people started to call him “the Magnificent”. 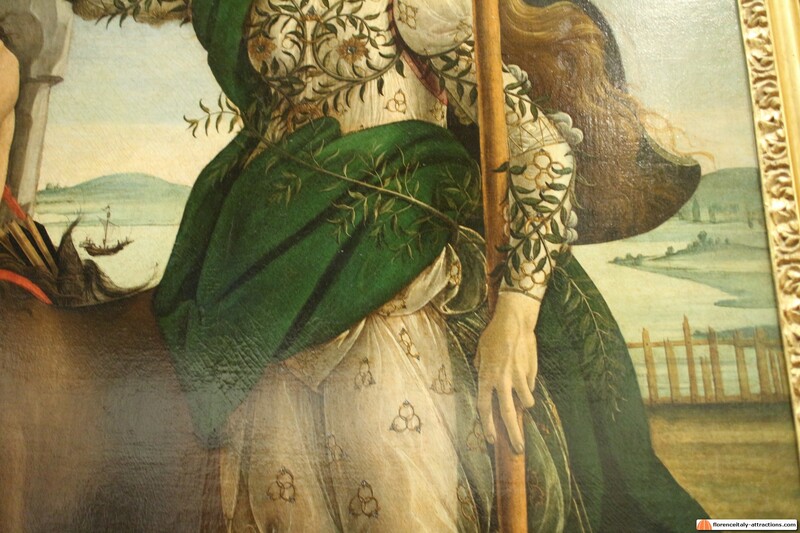 Botticelli Pallas and the Centaur actually represents Lorenzo as Pallas/peace, holding the instinct of the Centaur/war. The cloth of the Goddess is decorated with a motif that was the personal symbol of Lorenzo (rings with diamond) and enriched by olive tree branches (the olive tree is a symbol of peace). The landscape probably represents the Gulf of Naples, which is where Lorenzo went to deal with the King. 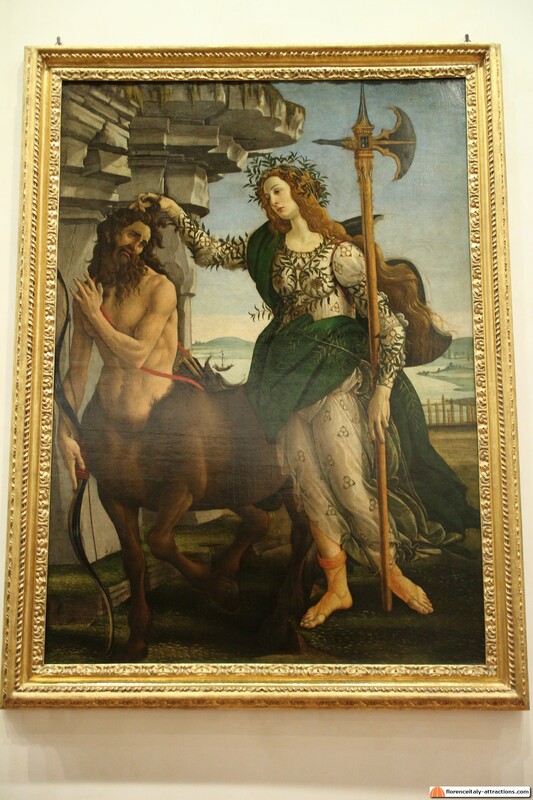 Someone believes that Pallas is an idealized portrait of Luisa de Medici, daughter of Lorenzo, but this is not very probable if you think that she was born in 1477, thus she was just five years old at the time Pallas and the Centaur was painted.